The famous college basketball coach, John Wooden, once wrote that he started out each season by showing the new players how to properly put on their shoes and socks so that they wouldn’t get blisters. He said blisters were a common problem that kept players from being able to play their best. At first players thought he was nuts to go over something as simple as putting on socks and shoes, but then they realized that making sure to do that seemingly simple task properly did make a difference in how they played overall. As usual, when reading this, our thoughts turn to gardening and one of the simplest tasks in caring for house plants – watering. It seems so simple, just pour water in the pot with the plant and all is good, right? Yes, sometimes, all is good if you just add water, but if you pay a little bit more attention to this simplest of tasks, you can avoid a few problems and your plants will be healthier in the long run. Of course if a plant is wilting, water it. And look at the plant as you water it to see if it has any signs of disease or insects, or needs a little trim here and there. Maybe you’ll even find a flower bud! Or a bloom! Finally, try to avoid watering with water straight from your water faucet. But if you must, let the water sit overnight and get to room temperature. Watering, like putting on your shoes and socks, is such a simple task, but doing that simple task well could make a big difference! I always water houseplants with lukewarm water from the tap. I don't know whether they care (I presume they do), but it makes me feel better anyway! I have to add one comment about watering wilting plants. Most of the time plants wilt because the soil is dry -- but sometimes, an over-watered plant will wilt because all that water is causing the roots to rot, so more water will just make things worse. Always check the soil before watering! Even if they are wilting! Hmmm, just when do your thoughts NOT turn to gardening, Carol? :) I do have one question--is tap water that has gone through the water softener the best for plants? Just in case, I fill up a pitcher from the water dispenser on our fridge, which has filtered the water. I do let it set out till it's lukewarm. Just wondering if I'm worrying needlessly. Good point, Greensparrow. Sometimes a wilted plant has rotted roots from too much water. And Rose, softened water isn't the best for plants... it is high in sodium believe it or not. I try to use "hard" water, which I have available in my sunroom. You'd think watering would be that hard to do, but I struggle with remembering to do it. I've killed more plants by forgetting to water. I wish I had a tap with hard water available for the winter. I guess I could go bring in a pan of snow. I'm sure we all forget at times. I have learned to love cacti! I was going to say the same thing as Greensparrow. We almost lost our aloe collection because they were sitting in a decorative bowl of water and started rotting. Someone thought they were wilting and added more water. By the time I discovered what was going on, I needed to repot them in totally new soil. Fundamentals are the most important things. thanks for the reminder. Watering is the essential for most gardening but the most important is not to overwater - I have often been guilty of forgetting to water and then panicking as to whether the plant will recover - most do unless the leaves have already gone to the brown crispy state! 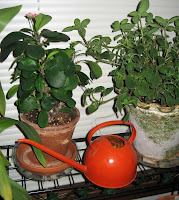 But over watering has killed more houseplants than I care to remember. My mother has alzheimers and tends to do some mad stuff - watering the plants several times a day is one that I need to keep an eye on! It is generally not paying attention to the simple things that cause big problems!